Recently, Dr. Terry Mortenson of Answers in Genesis responded to one of my articles (Trillions of Stone Age Artifacts: A Young Earth Anthropology Paradox) which claimed that the presence of trillions of stone artifacts scattered across Africa is a significant problem for young-earth creationism (YEC). He questioned the fact that so many artifacts could be produced even over long periods of time and whether many of these shards of stone were even artifacts at all. He went as far as to suggest a global flood 4500 years ago could lead to conditions that shaped many of the rocks that are called Stone Age artifacts. So now we have many interesting questions to test. Could most of the so-called “Stone-Age” artifacts be the products of rocks shaped by catastrophic flooding events and its catastrophic after-effects? Are these rocks, which anthropologists classify as artifacts, simply the product of random forces rather than deliberate design? One fact to know is that stone artifacts, also called lithics, are so common in South Africa that museum curators and anthropologists are not interested in collecting them all. In other words, stone artifacts are not rare. These scientists even approve the development of shopping malls to be built over what they conclude are ancient stone tool production centers. Paleontologists can survey a site, collect hundreds of pounds of stone tools and other artifacts, and even though they have collected far less than 1% of the material at a site, they don’t feel the need to collect any more material. Such is what has happened in the small town of Kathu, South Africa. Today a small strip-mall sits atop tens of millions of stone tools and byproducts of the tool production called “debitage” produced long ago. Earlier this year I wrote about the stone-tool production site in Kathu, South Africa (How Rare are Stone Age Artifacts: A visit to a Stone Age Tool-making Center in South Africa), but Dr. Mortenson doesn’t seem to have fully comprehended the magnitude of the density of stone artifacts found here or the significance of the context in which they are found. In fact his critique seems to imply that much of what we call stone artifacts are not artifacts at all. In response to Dr. Mortensen’s article I want to go a few miles down the road and look at another less dense stone-artifact site. Here we can begin to evaluate Dr. Mortenson’s claims and see if they make sense. Just outside of Kathu, there are several small (<0.5 square kilometer) depressions, one of which was the first site to be studied in detail in this part of South Africa. This area doesn’t look particularly dramatic today. In the Google Streetview image below you can see that the topography is relatively flat and could be characterized as a semi-desert region. One depression in this relatively flat landscape, called Kathu Pan 1, has been the subject of numerous archaeological digs. This depression was originally formed by sinkholes caused by the result of erosion of the limestone rock beneath. The water table is relatively shallow in this depression, supporting vegetation not found in the surrounding landscape. Detailed studies of sediment chemistry and preserved plant material tell us that at times the depression contained a small marsh or lake, and at other times it simply supported more vegetation as compared to the drier land around the depression. Therefore, it is likely that many times in the past this area was an attractive place to gather and make camp while hunting animals in the surrounding plains. Even during times of occupation, sands from the surrounding land would have continually collected in the depression, gradually filling it with sediment. Today more than 20 feet of hardened (partially cemented) sediments sit on top of the bedrock. Just a few years ago, archaeologists reached the lowest and oldest layers of the sediments that fill this depression, and they found an especially large number of stone tools. In figure 3 of Wilkins and Chazan’s 2012 description of this site (see figure to the right), you can see the considerable sedimentary layers in this depression. The different colored layers indicate the effect of different climatic conditions when the sediments were deposited. Stone tools and remains of animals are found throughout these layers, but it is the lowest layer labeled 4A, the Fauresmith layer, that is of special interest to us here. How many stone tools have been found so far? This buried layer of sediment contains thousands upon thousands of stone blades, which are believed to have been used primarily as spear tips. In just a small portion of the lowest sediment layers surveyed, over 6000 stone artifacts were retrieved including 972 complete stone blades. In addition to these artifacts, thousands of additional artifacts have been found in the layers above the 4A layer, all the way up to near the very top. It seems that this site was inhabited and in use as a hunting camp or gathering place of some sort for a very long time. The complete tools and stone flakes found here did not originate from the rocks in the immediate vicinity of the depression. No source rock of similar composition to the blades is found there. 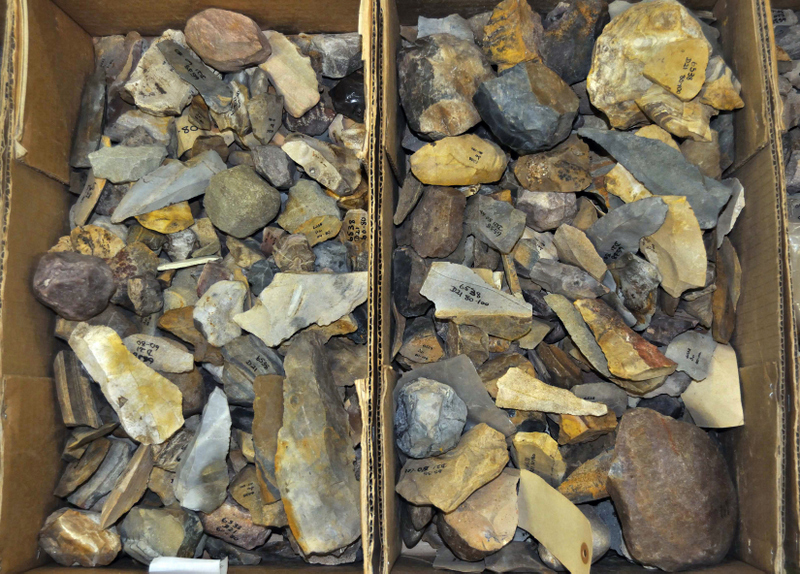 Some of the blades likely came from the Kathu Townlands stone tool production site several miles away, but other tools are composed of material that must have originated much further away. It is almost certain that these stones were carried intentionally to this location. In addition, because there are many more stone byproducts (debitage) present than there are complete tools, we can reasonably infer that source stone was brought to this site and then tools were fashioned at this location.Where did these tools come from? Some of the pebbles and cobbles [that appear to be Stone Age tools] would have been rounded while others would have been chipped and flaked by the agitation in those debris flows. Thus these extensive deposits of pebbles and cobbles of various sizes and shapes are not the work of “stone-age” people over millions of years of tool-making but are better explained by the work of catastrophic natural processes in a very short time. So could most of the so-called “Stone-Age” artifacts just be the products of rocks formed by “residual catastrophism” after a global flood 4500 years ago? Are these rocks simply the product of random forces rather than deliberate design? Kathu Pan 1 provides a test of this random origin hypothesis and Mortenson’s idea fails completely here. Why? Let us look at what we observe at Kathu Pan 1. Here we have a sand filled trap with scattered stones. Clearly there are large numbers of blades, which I don’t think anyone would deny are the product of a deliberate manufacturing process, even Dr. Mortenson. (Even if he may wish us to dismiss them as mere shards of stone produced by random interactions, there are too many other artifacts that have tell-tale signatures of being remains of stone tool production. A stone-tool expert can tell which stones are the products of deliberate stone tool production versus just accidental fracturing via random collisions. ) Remember as well that, in this depression, these artifacts are not composed of materials found in the immediate region, and so they were not washed into this depression and are not simply fractured pieces of bedrock. How could they have gotten there? The most reasonable explanation is that stone material was brought to this site, where it was manipulated to produce blades with hundreds of chips and flakes of rock, called debitage, left in the depression sediments in the process. In other words, at this site it is possible that a significant portion of the stone fragments found in the sediments are the result of deliberate intelligent manipulation. How many stone artifacts (tools plus debitage) might there be in the Kathu Pans? The site described above is only one of no less than ten depressions within a radius of several miles. All of these depressions have been shown to contain many stone artifacts. In addition, many other locations around Kathu, South Africa, show a very high abundance of stone artifacts as well. Let’s do some conservative calculations to get some idea of how many tools are likely found in the sediments of these depressions. It is a fact that over 6000 stone artifacts have been pulled from one test pit in Kathu Pan 1, just from the lower layer of sediments. That layer included 972 complete blades, undeniably the result of intelligent production. Given that thousands of additional artifacts and additional complete stone implements were found in the layers above where the 972 blades were found, let’s just use 1000 complete tools and 10,000 byproducts (debitage) of tool production as round numbers—an extremely conservative estimate. Now the volume sampled so far likely represents less than 1% of the sediments in this depression but lets say it represents as much as 10% of the total. If so, there are a minimum of 10,000 complete tools and 100,000 thousand artifacts of tool production in this depression alone. Those numbers are likely far too conservative. I think it would not be unreasonable to suggest that there are closer to 100,000 complete tools and another 1 million artifacts of tool production at this site. Multiply these numbers by many other depressions in this local region of and then to hundreds of other known sites of stone tool production in South Africa and you start to get the idea: stone tools are not uncommon in this part of the world. Take, for example, the much larger Kathu Townlands site five miles away, which has a far denser concentration of stone artifacts (see: How Rare are Stone Age Artifacts: A visit to a Stone Age Tool-making Center in South Africa). The estimates quickly add up into the hundreds of millions of artifacts in this small part of South Africa. The time required to locate source rock and then produce and find uses for this number of stone tools must have been extensive. The numbers themselves should give anyone reason to pause and ask themselves how they might explain the origins of these artifacts. But I want to point out one other important feature of this site that is especially challenging to the YEC hypothesis of Ken Ham, Dr. Mortenson and Answers in Genesis. Notice where most of these artifacts are found: buried under more than 10 feet of sediments that themselves have thousands of stone artifacts and remains of animals embedded within them. These are not simply stone tools dropped recently, say just 4000 years ago, on the surface of the land. These are stone tools that were made and used before more than 10 feet of sediments filled this depression. And during that entire time of burial, additional stone tool manufacturing, which show a trend of greater and greater sophistication in production, occurred as the depression was slowly filled with sediments. The area around Kathu speaks quite loudly of a long, complex history of tool production. Even the chemistry of the sediment layers tells a story of changing environments over time, and so we know these tools were not all deposited here at one time or even over a short period of time. You may have also noticed from the figure above that dating of materials in these sediments identifies the age of these lower layers at about 500,000 years while the tools found in the very top portion of the sediments are less than 20,000 years old. This range of dates suggests a very long history of occupation probably interrupted by hiatuses lasting thousands of years at a time. Even if only occupied sparsely over this time frame, the number of artifacts found here would not be a shockingly large number given the time available for tool production and loss. A creationist’ approach to Kathu? Given the YEC timeline of Earth’s history, the tools at Kathu had to have been produced and buried after a global flood 4500 years ago. Here then is Ken Ham’s and Dr. Mortenson’s best speculation. People scattered from the Tower of Babel 4250 years ago, ran all the way down to the bottom of Africa and produced hundreds of thousands of blades in just a few square miles alone, only to have them all buried under more than ten feet of sediment. What sort of population sizes would be required for this to have occurred in the span of just a few hundred years? Why would people have simply “lost” perfectly good blades right here? I ask this latter question because archaeologists consider most of these blades as simply those that were misplaced in production or left behind when the group moved to a new location and then were buried in the sands or marshes of the depression. Most blades would have been utilized in the surrounding plain where some would be dropped, some would be broken in use and left, and some would be left in a carcass of an animal it helped to bring down. So the number of blades found here in the depression is just a fraction of the overall pool of blades used by hunters in this region. Lastly, it is worth noting that people have practiced agriculture and herded domesticated animals for thousands of years in this region and thus have had no need for stone tools, especially such crude ones as are found in the deep sediments of these depressions. So the entire stone tool industry witnessed by the artifacts found here must be compressed into an exceedingly short time frame in the YEC chronology of human history. Dr. Mortenson and Answers in Genesis has a problem on their hands and it appears Dr. Mortenson is well aware that stone artifacts present a serious challenge to the young earth paradigm. Avoiding the problem by suggesting that these artifacts don’t exist is directly contradicted by observational science. What I have done here is examine the context of their preservation of artifacts for just one location in Africa. There are hundreds of other well-described sites in which Dr. Mortenson can find observations of artifacts that contradict his hypotheses should he be willing to look. In the next two posts we will look at another well-known artifact location: the Saharan Desert in Egypt. Here we will find more evidence of extensive stone-tool use, in some cases only miles from early Egyptian dynastic ruins. Chazan, M., Wilkins, J., Morris, D., & Berna, F. (2012). Bestwood 1: a newly discovered Earlier Stone Age living surface near Kathu, Northern Cape Province, South Africa. Antiquity, 86(331). Porat, N., Chazan, M., Grün, R., Aubert, M., Eisenmann, V., & Horwitz, L. K. (2010). 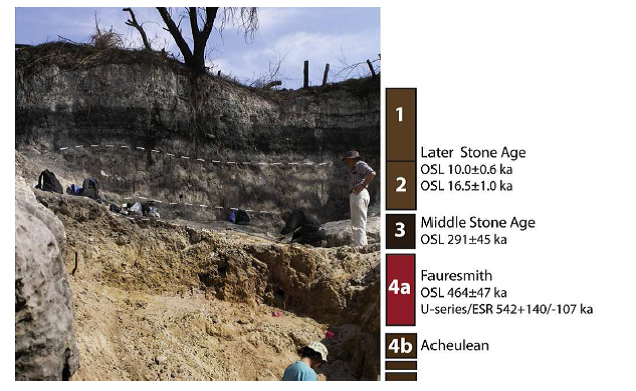 New radiometric ages for the Fauresmith industry from Kathu Pan, southern Africa: Implications for the Earlier to Middle Stone Age transition.Journal of Archaeological Science, 37(2), 269-283. Wilkins, J., & Chazan, M. (2012). Blade production∼ 500 thousand years ago at Kathu Pan 1, South Africa: support for a multiple origins hypothesis for early Middle Pleistocene blade technologies. Journal of Archaeological Science, 39(6), 1883-1900. Walker, S. J., Lukich, V., & Chazan, M. (2014). Kathu Townlands: a high density Earlier Stone Age locality in the interior of South Africa. Cover image: Stone artifacts from Colorado: Douglas Bamforth, Anthropology professor for the University of Colorado at Boulder places his hand on one of more than 80 artifacts unearthed about two feet below Boulder resident Patrick Mahaffy’s front yard during a landscaping project this past summer. The artifacts, which may have been made during the Clovis period nearly 13,000 years ago, were neatly arranged in a cache near where this portrait was taken, suggesting that the users of these instruments may have intended to reuse them. Credit: Photo by Glenn J. Asakawa/University of Colorado University of Colorado at Boulder. “Clovis-era Tool Cache 13,000 Years Old Shows Evidence Of Camel, Horse Butchering.” ScienceDaily. ScienceDaily, 26 February 2009. I wonder, is the irony of AiG arguing against the intelligent design of stone tools lost on them? Yes, I’ve wondered the same thing. In fact my fourth article in this series is going to look closer at the “design” argument. I suspect that Mortenson just needed a reason to avoid the implications of so many artifacts and so grabbed onto this one, but like most YEC arguments they don’t think about how one ad-hoc explanation here effects another explanation somewhere else. Great discussion of stone tools. I appreciate you making the effort to bring this sort of information to the public. I just have one quibble with your third paragraph. Anthropologists collect human artifacts. Certainly, archaeologists do. Paleontologists? Not so much. Paleontologists study everything but humans and their artifacts. Unless of course you are talking about paleoanthropologists, who study that grey area between paleontology and anthropology. Thanks, I’ll surely take one quibble. I really appreciate you taking the time to read. I’ll get that corrected and please feel free to correct me on these matters. Its a bit of a challenge to take more technical terms (eg. I would have liked to use the term lithics in the title but I figured that wouldn’t be appropriate for my particular audience) and apply more common usage especially since this is not my field of expertise. Please leave a response. I will reply as soon as I am able.